Joint employer questions have vexed companies like McDonald’s and Microsoft, which have faced claims that they’re on the hook for labor violations against franchisee and staffing firm workers, respectively. Obama administration moves to expand joint employment have been hailed by advocates as a way to give workers a stronger voice on the job with the company actually setting the terms of their employment. The DOL is widely expected to take a more moderate approach than a stalled Obama era overtime rule, which was projected to make some 4 million workers newly eligible for overtime pay. Business lobbyists argued that it would have forced companies to cut jobs to cover payroll. The Obama rule would have doubled the salary threshold—up to about $47,500 from $23,500—under which employees are automatically entitled to time-and-a-half pay for all hours worked beyond 40 in a week. The big question is where this Labor Department will set the threshold. 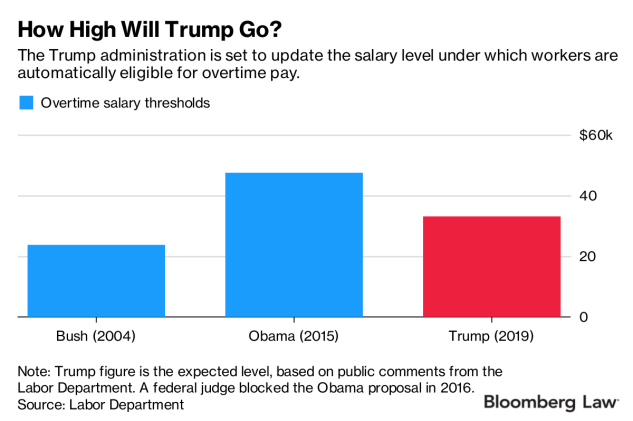 “It’s one of the concrete things that the president and the Labor Department can do to jump-start middle class wage growth,” Paul Sonn, an attorney with the National Employment Law Project, told Bloomberg Law of expanding overtime pay. Sonn was among a number of worker advocates who urged the Labor Department to move forward with the Obama overtime rule during a recent public listening session in Providence, R.I. Businesses groups, led by the International Franchise Association, have been urging the Labor Department and the NLRB to limit the situations in which companies can be tagged as joint employers. They’re concerned about companies being made liable for wage and hour and other violations against other workers those businesses don’t directly control. The new rules are likely to roll back the Obama administration’s expansive approach. Supporters of the Obama rule said it would help cut through complicated contract arrangements that allow some companies to shirk their responsibilities under federal labor and employment laws. The unified agenda is a semiannual report that lists each agency’s best understanding of what actions it intends to take in the next 12 months. It’s a preliminary overview that may change, as some actions may be added and others removed. Actions can be notices, proposals, or final rules. The Department also gave updated release dates for two previously proposed rules mirroring union disclosure requirements from the George W. Bush administration. The proposals would be drafted by the Office of Labor Management Standards, which enforces the Labor-Management Reporting and Disclosure Act. The DOL now anticipates a December issue date for both. The two rules were included in previous agendas. The department wants a return to a 2003 LMRDA interpretation that subjects union subordinates, or “intermediate bodies” to financial reporting requirements. This would require public sector unions responsible to file annual spending reports if they were subordinate affiliates of national or international unions that are covered by the LMRDA. That could include a union’s regional council, for example. In the scond, the agency aims to re-establish the “Form T-1” that would require union trusts to file annual spending reports. Union trusts include strike funds or apprenticeship programs. The Bush DOL’s version, which was blocked by a legal challenge from the AFL-CIO, a labor federation representing 55 international and national unions, required union trusts with a total annual receipts of at least $250,000 to disclose its finances. “The LMRDA’s various reporting provisions are designed to empower labor organization members by providing them the means to maintain democratic control over their labor organizations and ensure a proper accounting of labor organization funds,” the department said in the agenda. Labor advocates view the proposals as an attempt to add more of a financical disclosure burden on unions and their affiliates.